I thought it was going to be impossible to actually find any records here on the island. I went to all 3 charity shops and came up blank. I put an advert in the paper – nothing. Then a FB friend came up trumps – he had found 8 old records in the garden shed when he moved into his house. The sleeves are in bad condition, but the vinyl records are fine for painting on. I was so excited, I really want these to look like planets. 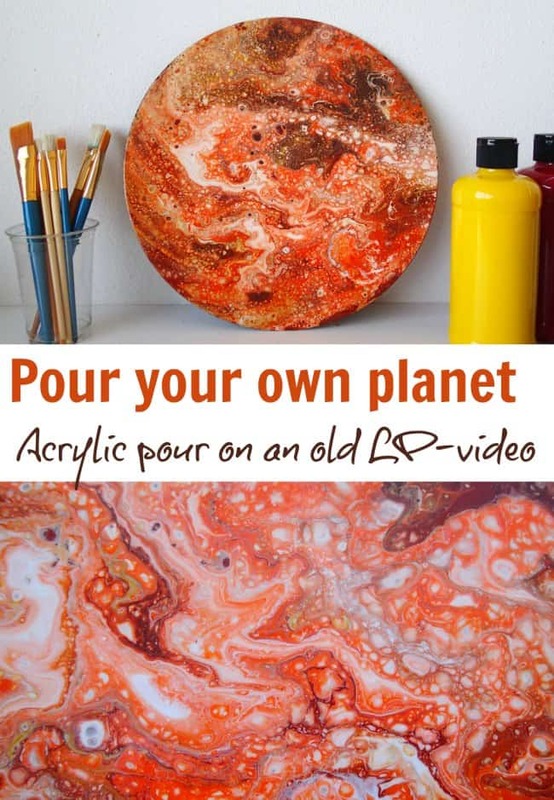 I took left over colors from a swipe I did here which I really wasn’t that keen on, but I thought the organic and natural looking colors would be great for a planet pour. What did you put over the hole of your record? This turned out beautiful! I enjoyed watching you manipulate the color spread buy turning the record as well as tilting…very nice. Thank you for sharing. What do you put your record on please to lift it from the table?